For months now, sports fans around the nation have had a frown on their faces. The National Football League is one of the most profitable organizations in the United States. But even they are in a lockout discussing the aspects of how to divide up billions of dollars in revenue and how much to pay players. The fighting is rubbing fans the wrong way. The average NFL fan is a middle class American citizen. That is why seeing millionaires fight with billionaires about money is not exactly endearing to the men and women who watch the NFL every single Fall and Winter and follow league news throughout the year. And now the same thing is happening to the National Basketball Association. However, the problems facing the NBA seem to be more difficult to fix. The second July came, the NBA’s collective bargaining agreement became invalid as it expired when the clock struck midnight. Talk about what would happen on this day and if the owners and players would not be able to draw up a new CBA before the deadline have been around for over two years. The NBA is officially in a lockout and there will be no practices, team meetings, or new signings until the lockout is over. The biggest issues dividing the players and owners center on money. The biggest issue is that the owners want to get rid of is the $58 million soft salary cap. Under the soft cap, loopholes needed to be used to get over the salary cap, but the loopholes were so simple to find that the majority of teams were well over the cap. Last season, the Los Angeles Lakers had a team salary of $91 million. Now the owners want a $45 million hard cap. Under a hard cap, teams would have to keep their salaries under $45 million year round. 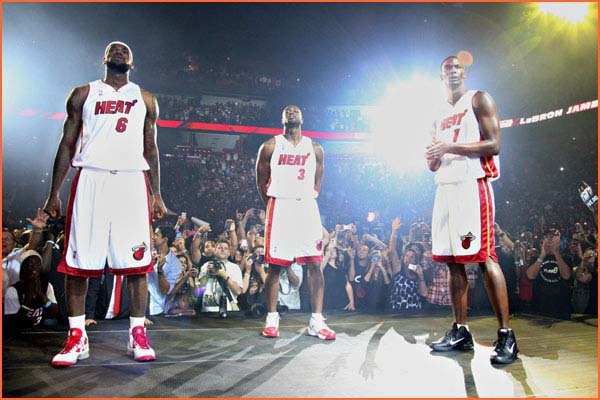 In Miami, LeBron James, Dwyane Wade, and Chris Bosh make about $47 million a year. Clearly the introduction of a hard cap would be a process where teams could slowly bring their salaries down over three years with a flex cap, but it would change the way players pick teams. Would a player like Chris Bosh or Carlos Boozer take a big pay cut to stay on their respective teams or would they take more money to play in Minnesota or Cleveland? The 2011-2012 NBA season is in jeopardy. Experts are predicting that at best, a 50 game season is likely. With owners wanting salaries to drop over thirty percent essentially, it is tough to see a resolution any time soon.